I loooooove peanut butter. Like, really. I also love smoothies. Particularly green smoothies with spinach. Flavorless when blended with other ingredients, but full of healthy stuff and tints your smoothie green. That’s just awesome. On the flip side, I’m not a huge fan of working out. I got a gym membership, and it quickly fizzled into going to yoga class once a week. Because yoga doesn’t make me sweat. Okay, well, I sweat a little… but…. you get the point. There’s a website that posts workout videos that I used to follow and do the workouts. If you are interested, it’s http://www.bodyrock.tv. Because of the immodesty and sexual nature of a lot of the work out titles and screen shots, I don’t really “promote” this website, and I actually quit following it for several months because it was getting continually worse. It does offer some great, short HIIT workouts that you can do at home with no equipment, and for that reason I decided to try it again today. So, I tried this 12 minute workout. Which morphed into a 9 minute workout because I died. Well, I finally got my sweaty self off the floor and into the kitchen to make my smoothie. My spinach smoothie. 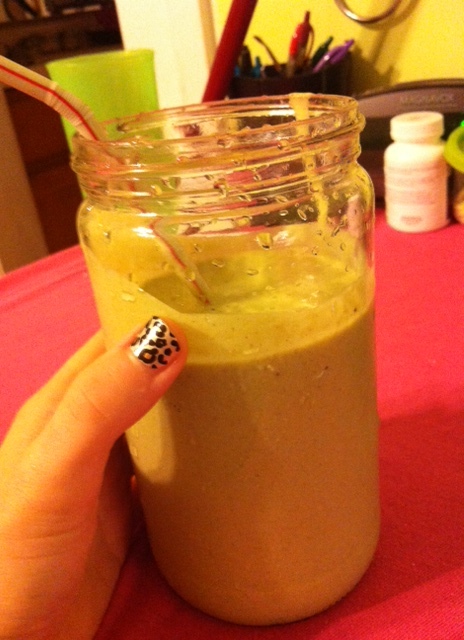 My spinach-peanut butter-oatmeal smoothie. And it was delicious. Absolutely delicious. It may sound gross, but let me tell you…. this smoothie is delicious!! Especially if you love peanut butter. I shared it with my 2 year old brother, with some leftover for me to drink for breakfast. Between the oatmeal and peanut butter this smoothie is SOOO filling. It was my dinner after my “work out”, and I feel great!! Here’s to smoothies!! And working out…. maybe….